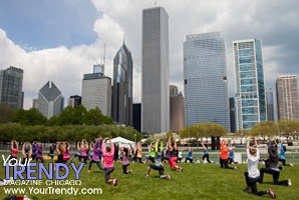 SELF Magazine’s iconic active lifestyle event, Workout in the Park returned to Chicago’s Grant Park with celebrity host Bob Harper, trainer on "The Biggest Loser" and #1 New York Times best-selling author. The highly anticipated event, attended by thousands of fitness enthusiasts each year, offers a fun-filled day of invigorating exercise, beauty consultations, healthy treats, and fabulous freebies – all designed to inspire women to re-energize their lives and feel their very best. From high-energy CRUNCH Fitness classes on the Main Stage, to Barre Assets, Yoga and Pilates in the Quiet Zone, to CrossFit in the Reebok Fit Zone, SELF’s Workout in the Park brought the best and latest workouts together in one place to put attendees at the center of the action. The event featured the ultimate total body-blasting workout with Bob Harper, who was on hand to meet fans and sign copies of his new book “Skinny Meals” which features over 100 delicious recipes under 350 calories. Attendees enjoyed exclusive giveaways from SELF Magazine and event partners including CRUNCH, Garnier and Reebok as well as Athleta, Aquaçai, Bai, Ban®, Health Warrior®, Emmy’s Organics, Fitbit®, GoGo squeeZ, KIND Healthy Snacks, popchips®, Truvia®, Lifeway Frozen Kefir and Victoria’s Secret Sport. This year’s participating charity was Cancer and Careers—an organization that provides vital support to working women and men with cancer.